How do you renormalize the Schrodinger picture wave functional? How do I reconcile the representation theoretic picture of the central charge in a CFT with the physical picture of the same? Can You Take the Cutoff To Infinity At A Conformal Fixed Point? How would you figure some of the methods (in order of importance) to take a picture of the supersonic bullet with the wave it produce in 1888? He used a spark as a light source, triggered by the bullet shorting the two wires that can be seen in the picture. A schematic of Mach's system can be seen in this slide. As far as I know the problems are triggering and a sufficient light-to-emulsion-sensitivity ratio. And if you light is bright and brief enough one solution might cover both parts. @mmc: That's an answer. Or at least a good part of one. Victor: what do you mean by "in price order"? He employed an innovative approach called the shadowgraph. A typical shadowgraph experiment is illustrated below. In this technique, light is passed through an airflow and reflected onto a screen or film plate. Since shock waves create changes in the temperature and density of the airflow, the light waves are bent, or refracted, as they pass through the shock waves. These refracted light patterns create shadows that can be seen on the screen. The signal from the trigger wires ( the two vertical lines in the photo you show) triggers a spark gap in a completely dark enclosure where the film is exposed and waiting. When the spark comes during the passing of the bullet the differences in the refraction index of the air from the shock wave are recorded. Actually we used the technique of triggered sparking to record cosmic rays passing through a spark chamber back in the 1960's. The film was continually exposed and was moved forward after the sparking/passing cosmic. The spark lasts nanoseconds only. It's very difficult to get very short exposures using mechanical shutters, so Mach used a spark discharge to get a very short light pulse that was bright enough to expose the film (the film "only cares" about the time-integrated exposure, not about brightness). The photograph was a shadowgraph, with the bullet casting a shadow over the film, because Mach was interested in seeing photographical evidence of the shockwaves he had predicted. 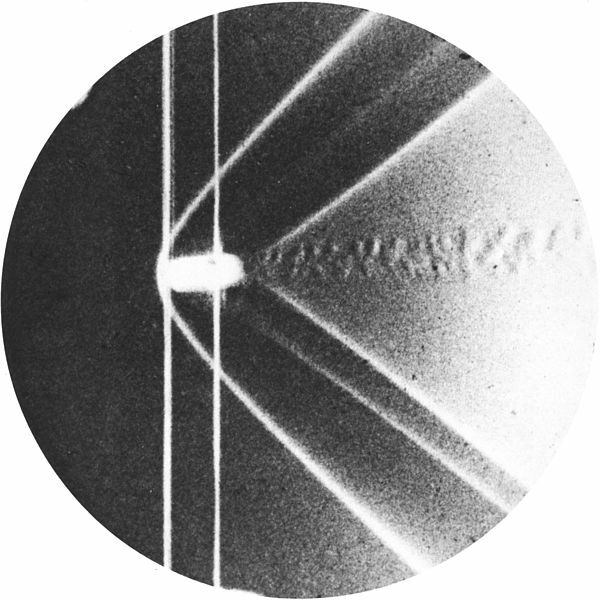 IMO Mach utilized Schlieren photography rather than shadowgraph. @LeosOndra I searched unsuccessfully for the original article. I have only been able to find indirect evidence such as similarity with other shadowgraph images and very indirect references (see p. 66 here).